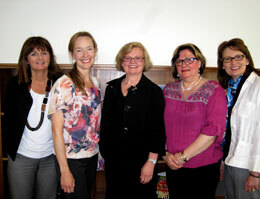 UNB Saint John's Evidence Synthesis Group recently became a member of the esteemed Joanna Briggs Institute (JBI), a recognized global leader in evidence-based healthcare. "I am delighted with becoming an officially recognized group with the JBI in Adelaide, Australia," says Lisa Keeping-Burke group convenor and assistant nursing professor at UNB Saint John. "This accomplishment acknowledges our group's efforts towards the advancement of evidence based nursing practice and with building research collaborations locally, nationally and internationally. It is an exciting time to be a faculty member in the Department of Nursing & Health Sciences." JBI collaborates with over 70 entities across the world to promote and support the synthesis, transfer and utilization of evidence through identifying effective healthcare practices. JBI is the research and development arm of the School of Translational Science based within the Faculty of Health Sciences at the University of Adelaide, South Australia.